Jacob Furland (Classical, Providence, RI) continued his late season hot streak. 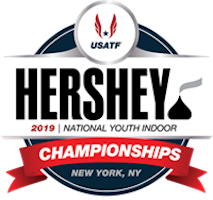 After winning Weightarama earlier in March, he captured the win at the Hershey USATF Youth Indoor Championship on Saturday. Little more than a foot separated the top three boys and Furland came through with a personal best to jump into the lead and claim the win at 72’03.75″. In the girl’s competition Furland’s teammate Cheyenne Figueroa (Classical, Providence, RI) easily captured the win by nearly eight feet.